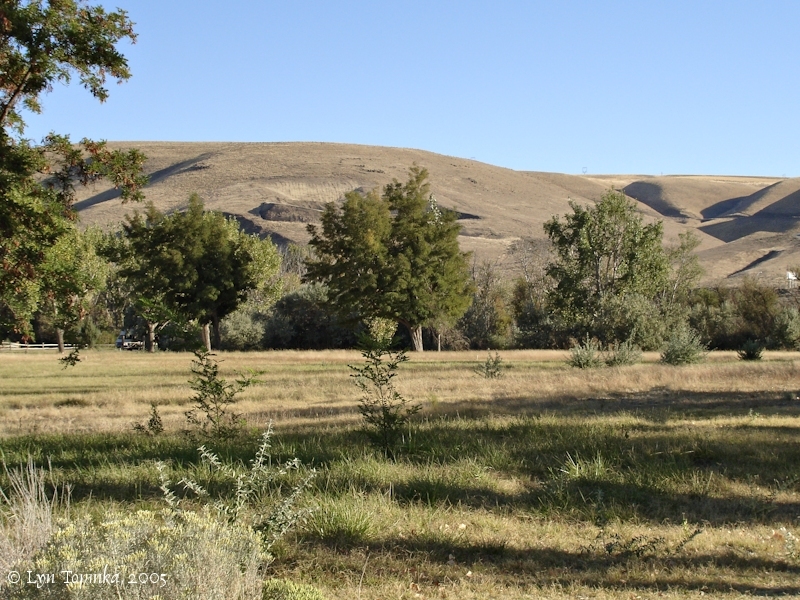 "Madame Dorion Memorial Park, Washington"
Click image to enlarge Madame Dorion Park, Walla Walla River, Washington. Image taken September 25, 2005. Madame Dorion Memorial Park is located at the junction of Washington State Highway 12 and Highway 730, at Columbia River Mile (RM) 315 (Lake Wallula), where the Walla Walla River meets the Columbia. During winter of 1811-1812, an advance party of the first fur traders reached the Columbia River from Montreal, Canada. With them was Marie Dorion, an Iowa Indian, who was the second women to come west overland -- the first being Sacajawea, with Lewis and Clark. Marie was the wife of Pierre Dorion, the son of the interpreter for the expedition. Marie came west with her husband and two children, Jean Baptiste and Paul. In 1931 the Madame Dorion bridge was built across the Walla Walla River, the remains of which can still be seen at the mouth of the Walla Walla. The nearby 46-acre day-use and camping park is also named in her memory. 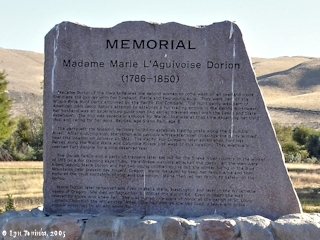 A brief "biography" of Marie Dorion is engraved on a stone marker at the Madame Dorion Memorial Park at Coumbia River Mile (RM) 315. The information is brief and not quite accurate, but portrays the spirit of this pioneer woman. 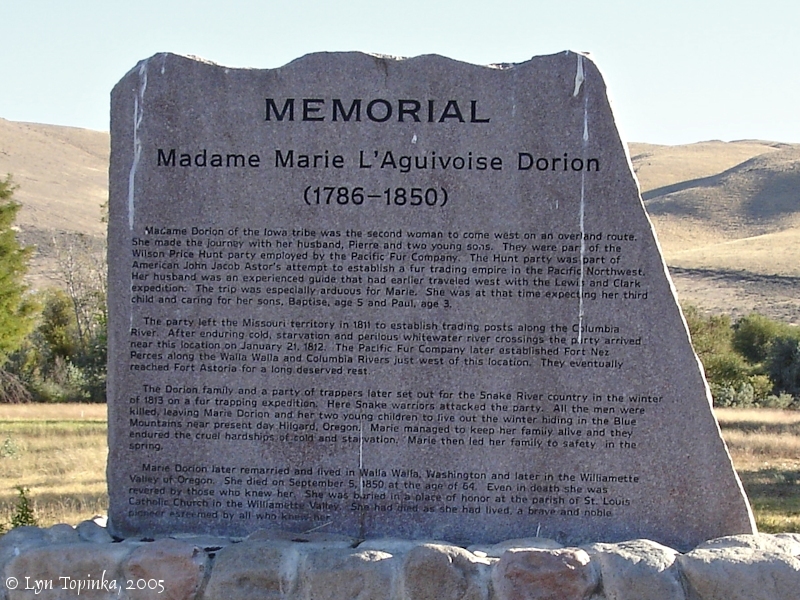 "Madame Dorion of the Iowa tribe was the second woman to come west on an overland route. She made the Journey with her husband, Pierre and two young sons. They were part of the Wilson Price Hunt party employed by the Pacific Fur Comany. The Hunt party was part of American John Jacob Astor's attempt to establish a fur trading empire in the Pacific Northwest. Her husband was an experienced guide that had earlier traveled west with the Lewis and Clark expedition. The trip was especially arduous for Marie. She was at that time expecting her third child and caring for her sons, Baptise, age 5 and Paul, age 3. The party left the Missouri territory in 1811 to establish trading posts along the Columbia River. After enduring cold, starvation and perilous whitewater river crossings the party arrived near this location on January 21, 1812. 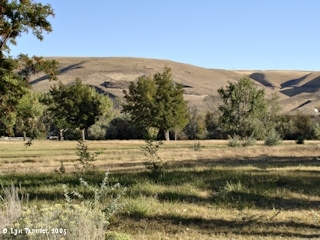 The Pacific Fur Company later established Fort Nez Perces along the Walla Walla and Columbia Rivers just west of this location. They eventually reached Fort Astoria for a long deserved rest. The Dorion family and a party of trappers later set out for the Snake River country in the winter of 1813 on a fur trapping expedition. Here Snake warriors attacked the party. All the men were killed, leaving Marie Dorion and her two young children to live out the winter hiding in the Blue Mountains, near present day Hilgard, Oregon. Marie managed to keep her family alive and they endured the cruel hardships of cold and starvation. Marie then led her family to safety in the spring. Marie Dorion later remarried and lived in Walla Walla, Washington and later in the Willamette Valley of Oregon. She died on September 5, 1850 at the age of 64. Even in death she was revered by those who knew her. She was buried in a place of honor at the parish of St. Louis Catholic Church in the Willamette Valley. She had died as she had lived, a brave and noble pioneer esteemed by all who knew her." Click image to enlarge Sign, Madame Dorion Park, Walla Walla River, Washington. Image taken September 25, 2005. The old concrete-construction Madame Dorion Bridge was built in 1931 and partially torn down and abandoned in 1949. The Lewis and Clark expedition first met Pierre Dorion Sr. in June 1804 and hired him to travel upstream with them and be an interpreter. Dorion Sr. stayed with the expedition until late August 1804, when Captain Clark requested him to stay behind and work on a peace between local tribes. According to historians, Lewis and Clark did not meet Pierre Dorion Jr. - the son of their interpreter Pierre Dorion and the future husband of Marie Dorion - until August 29, 1804. The Expedition met "old" Pierre Dorion again on their return in 1806, but no mention is made of his son. "Native American Marie Dorion is remembered for her bravery and endurance in leading white men to the Oregon Territory, when she probably was in her early twenties. Her journey followed that of famed Sacajawea by six years, but Dorion’s 3,500-mile trek was both longer and much more difficult. Her epic story shows the strength and perseverance needed to survive alone and against all odds. Like other men of his heritage, he made a living in the fur business that centered in St. Louis. Fur trading involved almost constant travel, and Marie often accompanied him on buying and selling trips through what later became the states of North and South Dakota, Nebraska, Iowa, Missouri and even Arkansas. Both were familiar with several Indian languages, as well as French. Men of French heritage had far better relations with Native American women than other Europeans, and they often assimilated into their wives’ tribes. Like all North American natives, these were matrilineal societies in which heritage was traced through the mother, not the father. Marie, however, seems not to have used a native name; probably baptized into Catholicism early in her life, she also gave Christian names to her sons, Jean Baptiste and Paul. On December 30, 1811, Marie Dorion gave birth to her third child near North Powder, Oregon, but the baby died eight days later. After three days of mourning and recovering, the Dorion family caught up with the expedition. They made it to Fort Astoria on February 15, 1812, after a tortuous eleven-month trek. Marie and Pierre then joined a nine-member party that intended to secure a monopoly of the fur trade from the Rocky Mountains to the Pacific Ocean for Astor’s company. Again, Marie Dorion was the only female in the group. After building their main trading post near the mouth of Idaho’s Boise River, they created several outlying hunting-and-trapping camps during the winter of 1813-1814. They established a friendly relationship with most of the Shoshone who lived in the area, but a gang called the “Bad Snakes” persistently harassed the newcomers. After several encounters with the “Bad Snakes,” a Shoshone warned Marie that there might be trouble at the remote camp where her husband and two other men had gone. In the cold of January 1814, she took a horse and her children and set off for her husband's camp. After three days of fighting through mountainous snow, she reached the campsite – only to find that her husband was dead. Giles LeClerc, who was badly wounded, told her that the three of them had been attacked that morning while working their traps. Pierre and Jacob Reznor did not survive. Marie put Giles onto her horse with the two boys and began the frigid three-day journey to the main campsite – but had to stop when Giles’ condition worsened. Although she desperately tried to save him, he died. More horror greeted her back at the main camp: all the men there had been murdered, scalped, and dismembered. She was alone in the wildness with her little sons. [Marie] Dorion moved north to Fort Okanogan in modern Washington, and by 1819, was married to Louis Joseph Venier. They had a daughter named Marguerite before he, too, was killed by Native Americans. Jean Baptiste Toupin then entered her life, and because Marie lived by a different moral code, she bore two children, Francois and Marianne, prior to their belated 1841 marriage. The mother of five children by three men, she had learned independence early in life. 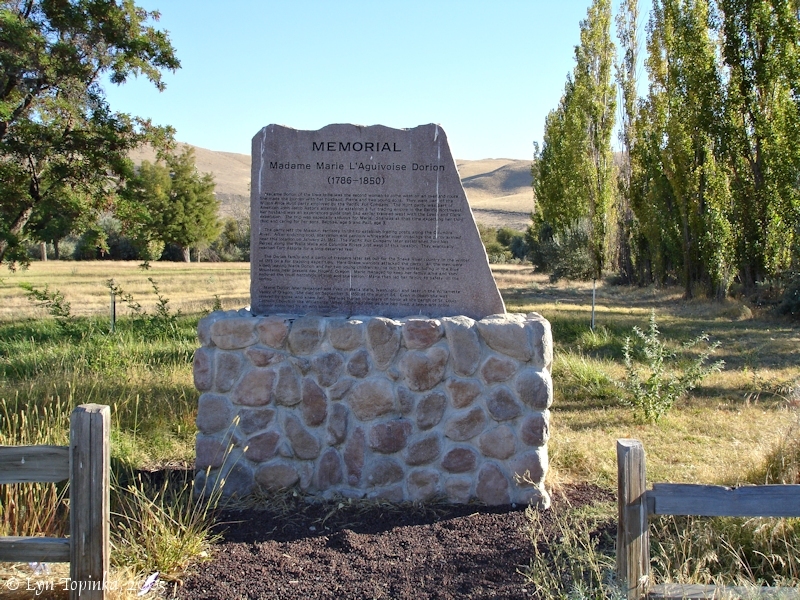 She and her children were the first settlers of French Prairie in Oregon’s fertile Willamette Valley, where white neighbors called her “an impressive and admirable woman.” Marie Dorion died there on September 5, 1850, just as the great migration on the Oregon Trail was beginning. Her son Paul escorted famous writer Francis Parkman on that trail, while Jean Baptiste went on to a career with the British Canadian fur-trading Hudson Bay Company. Several sites along the Walla Walla River commemorate Marie Dorian as the “Madonna of the old Oregon Trail.” ..."
Source: National Women's History Museum website, 2014, "Marie Dorion".